Srinagar: A seventh class student was killed after forces opened fire during clashes with the youth in north Kashmir’s Mandigam area of Qaziabad Handwara. Local reports identified the slain as Owais Ahmad Mir, son of Mushtaq Ahmad, a resident of Mandigam Qaziabad . Reports said that the youth in the area were protesting and also hurled stones at the forces when they were leaving the said area after voting was over. The forces retaliated with live ammunition during which Owais, 13, got injured. He was rushed to local Kralgund health center from where doctors referred him to Handwara in critical condition. Owais was declared brought dead by doctors in Handwara Hospital, locals said. GNS added that a 19-year-old Mohammad Yaseen Bhat was also injured due to pellet firing in Pattan and he was shifted to Trauma Hospital in the area from where he was shifted to Srinagar for specialized treatment. Reports of stone pelting clashes were also recieved from Shakoor Din Mohalla Hajin, Sadnar Sumbal, Khimna Bharabad Sumbal, Lank Reshipora Bandipora, Kazipora Bandipora, JamiaQadeem Sopore, Chewa Sumbal, Kralgund Qaziabad Handwara and Nowgam Sumbal. 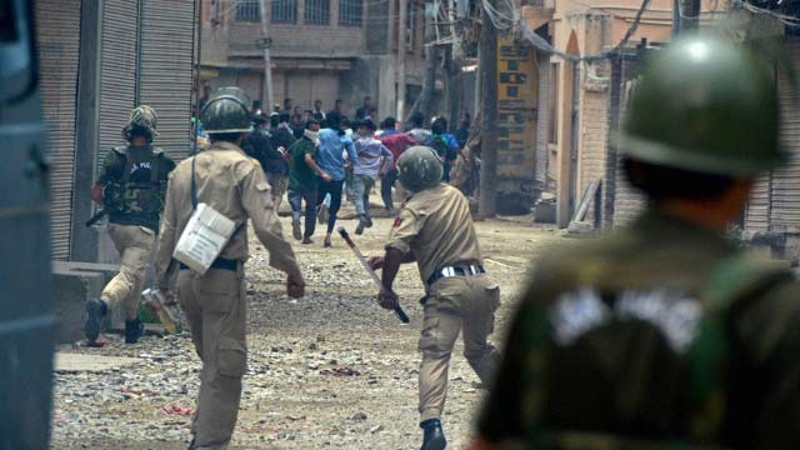 20 persons including a CRPF trooper, SRTC driver Abdul Hamid Wani, a goverment official Ghulam Qadri Sheikh and an ASI Mohd Ramzan were injured in clashes. Two voters namely Nisar Ahmad Sheikh and Bashir Ahamd Ganai received injuries after being pelted with stones at Aloosa Kralpora in Kupwara and Jamia Qadeem Sopore.